How Can Your Organization Leverage Diversity, Ensure Unconscious Bias is Removed and Embed an Inclusive Environment? For many organizations, the difference between diversity and inclusion is unclear. With a more visible face, diversity involves managing demographics, ensuring diverse people are employed and represented at all levels of the organization. Inclusion, on the other hand, lives in the less visible cultural nuances of how people feel about the organization and the people they work with and for. 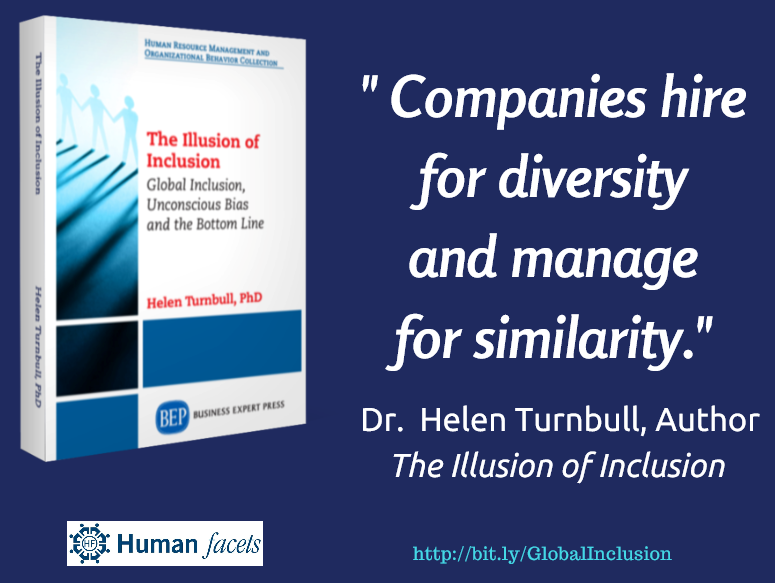 As diversity and global inclusion experts, we help organizations leverage diversity, ensure unconscious bias is removed and embed an inclusive environment. Our Unconscious Bias program offers a unique and robust solution to enable leaders to address their unconscious biases. The Unconscious Bias Program utilizes Cognizant™, our online assessment tool that enables leaders to see the pattern of their unconscious biases, both individually and collectively. This knowledge is then leveraged to create a more inclusive environment. Human Facets’® Embedding Inclusion program is a unique and comprehensive program designed to create an inclusive environment and embed new behaviors into the fabric of organizations. Utilized in Human Facets’® Embedding Inclusion Program, the Inclusion Skills Measurement Profile (ISM Profile) is an online 360 degree assessment tool developed by Dr. Helen Turnbull to help participants improve in seven categories related to embedding inclusion. Get the details on any of our programs and assessments, or contact us directly at (954) 370-6343 for more information.